A Doom mod where you can shoot only with your eyes closed. To be honest, not that well! An eyedetector program eyedetect.exe finds two eyes in your webcam image. When two eyes are found, it proceeds to check if the eyes are open or not. If the left or right eye is open, the b and n keys are held down respectively. In other words, eyedetect.exe send virtual keyboard events signaling the state of the eyes found in webcam picture. A custom doom WAD then detects these events and allows you to shoot only when b and n keys are held down. Run eyedetect.exe that opens up a window where you can see your face and some visual markers showing where it thinks you eyes are. Now keys are getting pressed if you blink your eyes. Now close both your eyes before attempting to shoot with a pistol. In the game only pistol shooting is restricted. See mod/wimp/DECORATE.txt for details. The eye detection is very fiddly and not reliable, which kinda ruins the fun. Sorry! The custom cascades lax_cascade.xml, less_strict_cascade.xml and strict_cascade.xml are trained using the same dataset but different settings. They should detect a 24x24 open eye in an image. In this project they are used to detect if eyes are open or closed inside the capture eye-pair area. They are all pretty bad but here for completeness. 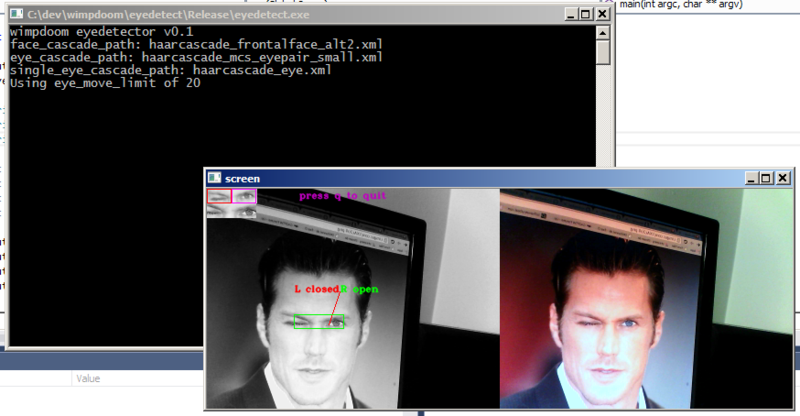 The default cascade used in the detector algorithm is haarcascade_eye.xml, which is bundled in a regular OpenCV install. See Training section below for details. This is just a technical tip. Variations were made to -minhitrate (0.999 in strict, 0.995 in lax). You need Visual Studio 2013. The solution file expects to find an OpenCV 2.49 installation in a directory one level up from the solution dir.